Musculoskeletal Imaging Musculoskeletal diseases debilitate millions of people and are tremendous burden on health care systems worldwide. It was estimated. 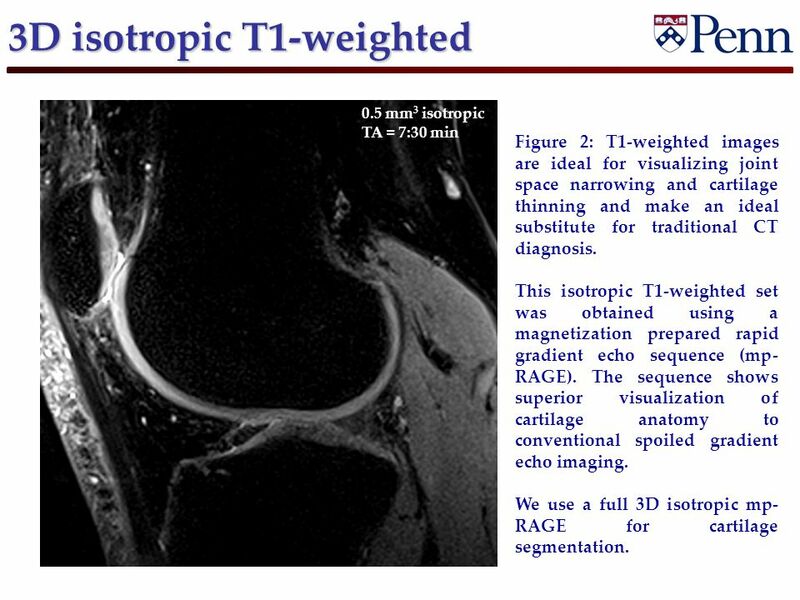 3 3D isotropic T1-weighted 0.5 mm 3 isotropic TA = 7:30 min Figure 2: T1-weighted images are ideal for visualizing joint space narrowing and cartilage thinning and make an ideal substitute for traditional CT diagnosis. 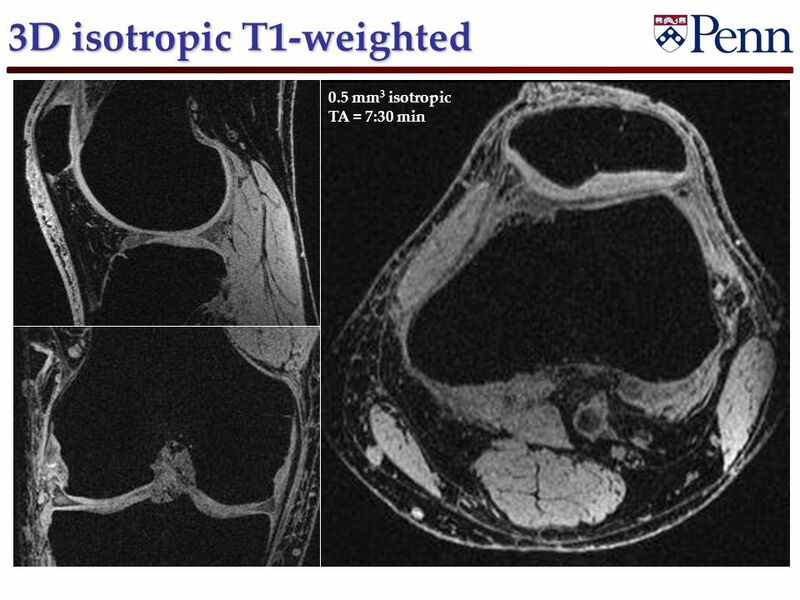 This isotropic T1-weighted set was obtained using a magnetization prepared rapid gradient echo sequence (mp- RAGE). The sequence shows superior visualization of cartilage anatomy to conventional spoiled gradient echo imaging. We use a full 3D isotropic mp- RAGE for cartilage segmentation. 4 2D multislice T2-weighted Figure 3: High resolution T2- weighted images can be obtained with in-plane resolutions less than 300 μm 2 and 2 mm slice thickness. 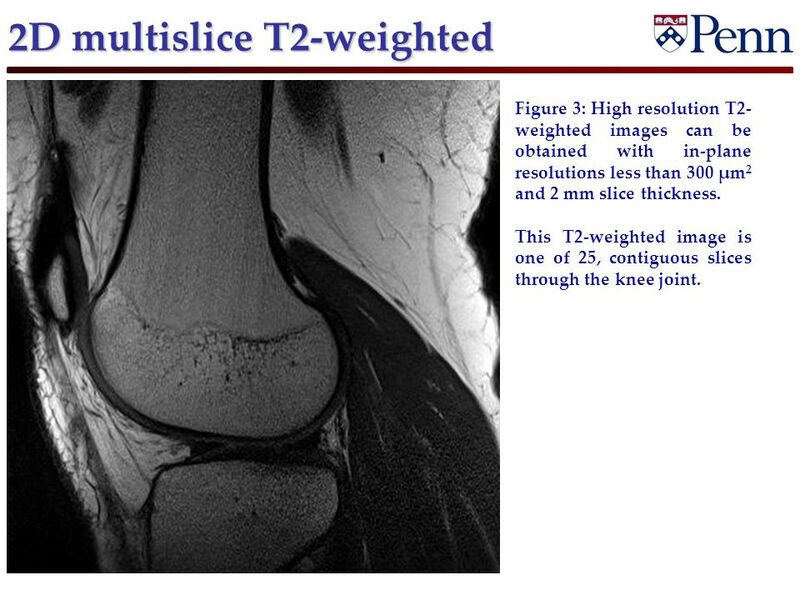 This T2-weighted image is one of 25, contiguous slices through the knee joint. 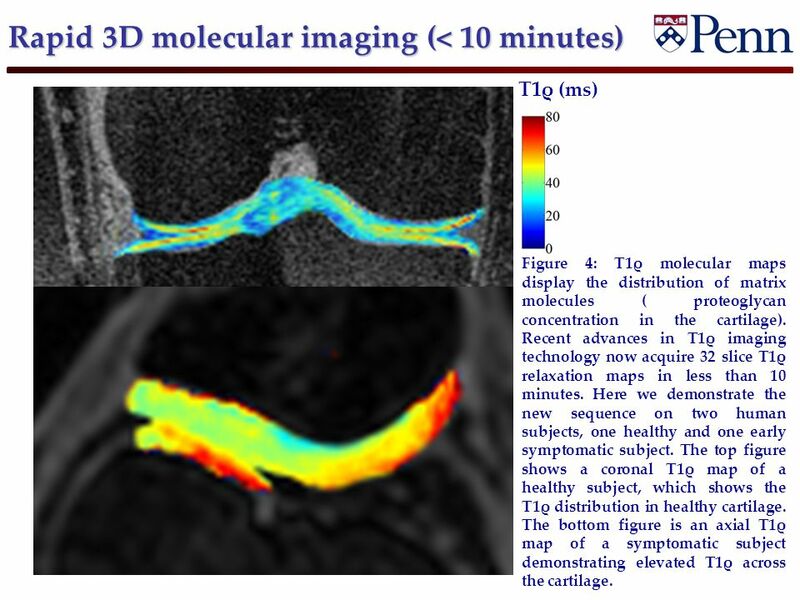 5 Rapid 3D molecular imaging (< 10 minutes) T1ρ (ms) 0.7 x 0.7 x 3 mm 3 32 Slices per view TA = 10 min Figure 4: T1ρ molecular maps display the distribution of matrix molecules ( proteoglycan concentration in the cartilage). Recent advances in T1ρ imaging technology now acquire 32 slice T1ρ relaxation maps in less than 10 minutes. Here we demonstrate the new sequence on two human subjects, one healthy and one early symptomatic subject. The top figure shows a coronal T1ρ map of a healthy subject, which shows the T1ρ distribution in healthy cartilage. The bottom figure is an axial T1ρ map of a symptomatic subject demonstrating elevated T1ρ across the cartilage. 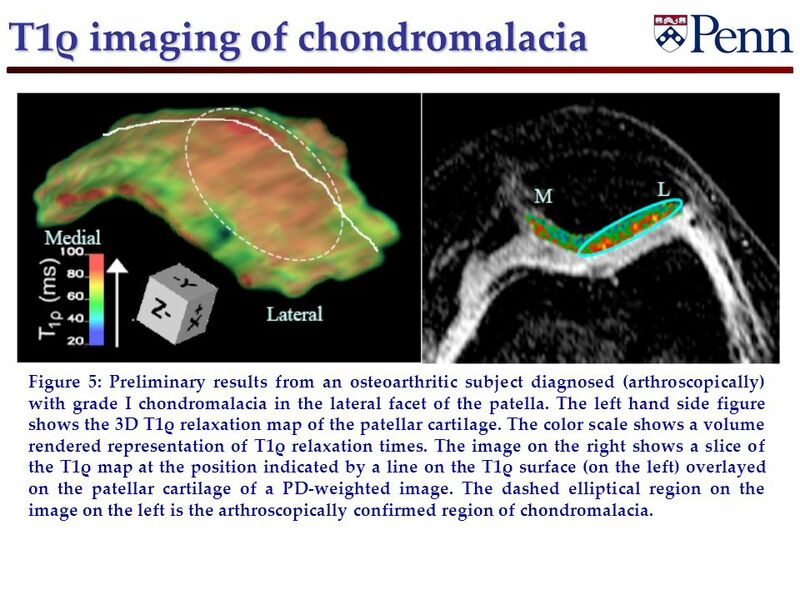 6 T1ρ imaging of chondromalacia Figure 5: Preliminary results from an osteoarthritic subject diagnosed (arthroscopically) with grade I chondromalacia in the lateral facet of the patella. The left hand side figure shows the 3D T1ρ relaxation map of the patellar cartilage. The color scale shows a volume rendered representation of T1ρ relaxation times. The image on the right shows a slice of the T1ρ map at the position indicated by a line on the T1ρ surface (on the left) overlayed on the patellar cartilage of a PD-weighted image. The dashed elliptical region on the image on the left is the arthroscopically confirmed region of chondromalacia. 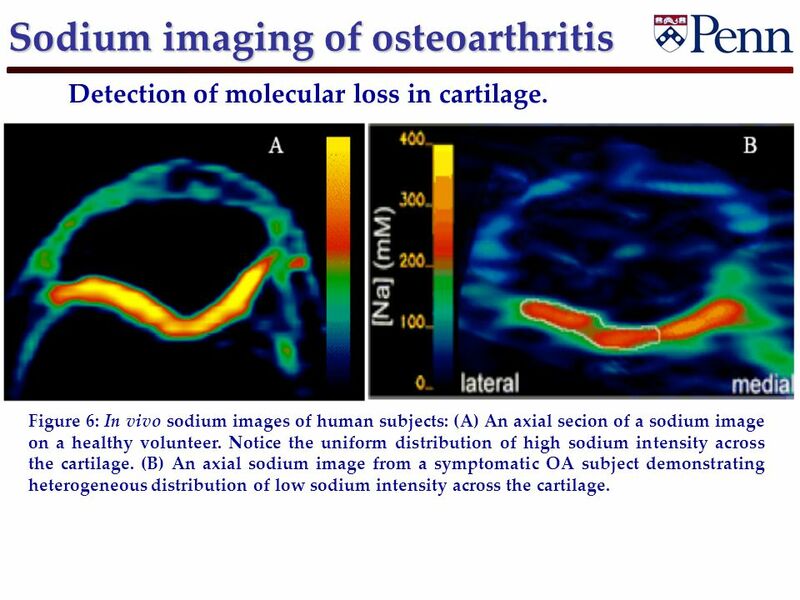 7 Sodium imaging of osteoarthritis Figure 6: In vivo sodium images of human subjects: (A) An axial secion of a sodium image on a healthy volunteer. Notice the uniform distribution of high sodium intensity across the cartilage. (B) An axial sodium image from a symptomatic OA subject demonstrating heterogeneous distribution of low sodium intensity across the cartilage. Detection of molecular loss in cartilage. 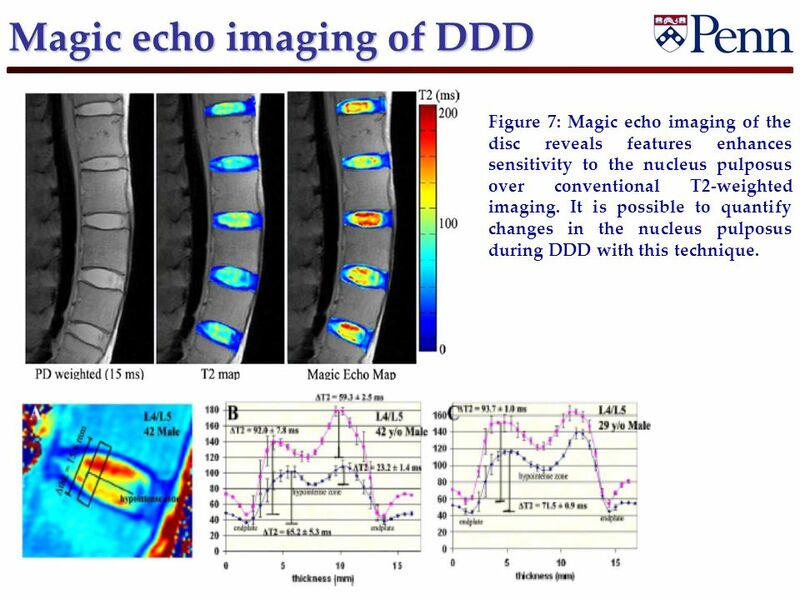 8 Magic echo imaging of DDD Figure 7: Magic echo imaging of the disc reveals features enhances sensitivity to the nucleus pulposus over conventional T2-weighted imaging. It is possible to quantify changes in the nucleus pulposus during DDD with this technique. 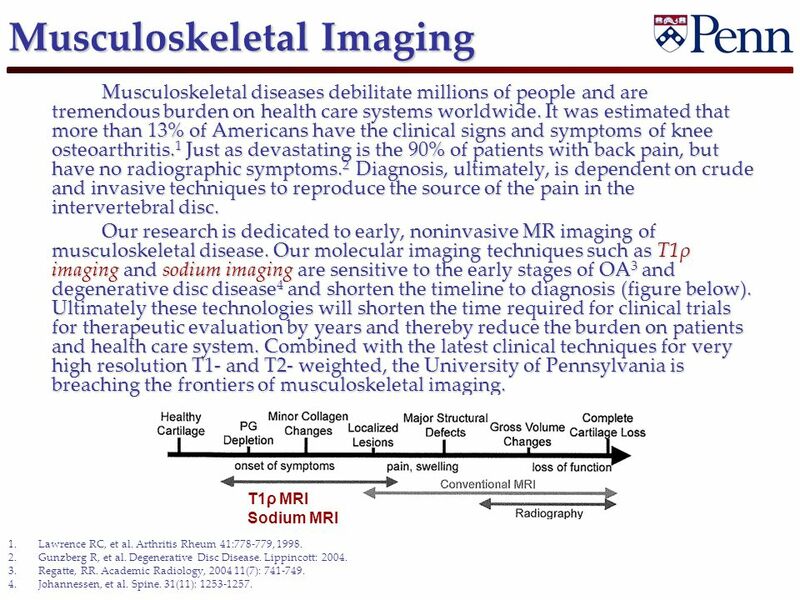 Download ppt "Musculoskeletal Imaging Musculoskeletal diseases debilitate millions of people and are tremendous burden on health care systems worldwide. It was estimated." New imaging strategies in Degenerative Disease of the Intervertebral Disks Functional Spine Imaging. 1 ProDisc L: Motion Preservation Device Performed by: Michael Janssen, DO August 20, 2007 Welcome High School Students!!! Degenerative Disease Dr. Sharifa AL-Duraibi. Neuroradiology Natasha Wehrli, MS4 University of Pennsylvania School of Medicine. 1 Michael O. Williams, MD FAAOS Edmond Orthopedic Group. Topics spatial encoding - part 2. Slice Selection  z y x 0 imaging plane    z gradient. Comparative Analysis of Continuous Table and Fixed table Acquisition Methods: Effects on Fat Suppression and Time Efficiency for Single-Shot T2-weighted. Don’t Just get Treated Get Fixed Right ! Quit Suffering Now. Quantitative Comparison of Conventional and Oblique MRI for Detection of Herniated Discs Automatic Herniation Detection A collaborative project with Doug. Three Dimensional Computed Tomography: Basic Concepts Chapter 17 Seeram. Cervical adjacent segment degenerative disease ; Is it a natural history or fusion disease? -comparison between adjacent level of fusion and non-fusion. Knee Pain: Osteoarthritis in some religious sectors due to biomechanical postural loading. A literature review Karol A. Donaubauer, BA, DC, CCSP Palmer. Medical Imaging. What is an image? ● An image is a function – from a spatial or temporal domain – into a two, three, or four dimensional space – such.